A unique and thrilling island experience you can't miss! Ziplines, Rope Course & More: find out about how many ziplines you'll encounter, how long and how high they are, the speeds you'll reach, and check out what other challenges await you! 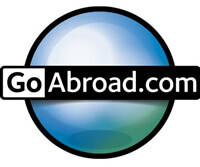 Planning, Itinerary & Bookings: departure times, schedule, itinerary, what to do before or after. 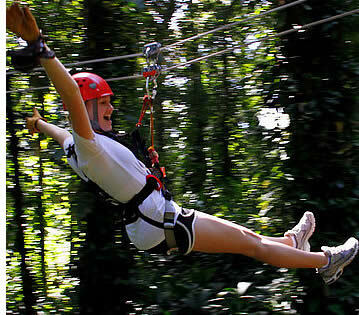 Bastimentos Sky Canopy Tour: located right next to one of Panama's most stunning National Parks, learn more about what makes this zipline canopy tour one of Panama's top eco-adventure tours! If you're going to Boquete during your Panama Vacation, you might be interested in our Boquete Tree Trek Cloudforest Canopy Tour. The ropes course offers visitors a great adventure because you're the one traversing yourself through the canopy via cable tightrope, floating logs, a cargo net and a sky-bridge. If you're hesitant about the idea of flying above the canopy in the first place, and prefer being transported by gravity almost effortlessly, you can skip the rope course. Our suggestion: give it a try. If you decide it is too much for you, we have the ability to guide you, and/or trolley or "zip" you across these sections. Our guests typically find that it is easier than it looks. * Prices are in US Dollars. The above prices are per person and do include Panama's 7% ITBMS Sales. Departure times for the tour from Red Frog's Public Dock on Colón Island (Bocas del Toro's main island) take place at 10 a.m. and 2 p.m. and cost $10 USD per person round trip (or $7 one way). 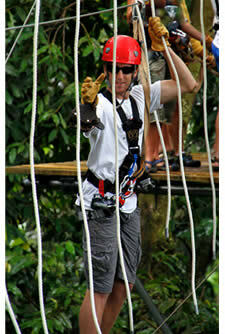 What happens if I start the zipline tour and I don't want to finish it? Guides are trained to be encouraging but will not pressure you or make you feel obligated to continue. The course is " challenge by choice" so if you feel that you cannot continue, you have the option to quit. 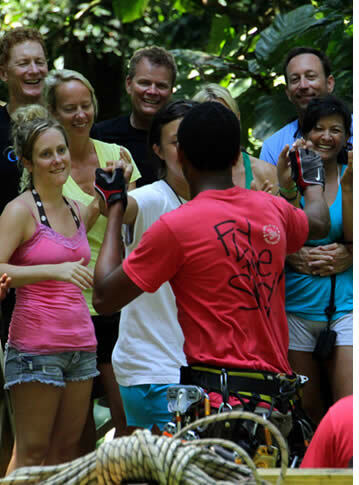 Please know that after the first zipline, the tour takes place on elevated platforms high above the jungle and will require a rappel down and will not be an easy hike back to the beginning or end of the tour (whichever is closer). In this situation, you will not be issued a refund. Let's plan your Bocas vacation...Click to collapse. 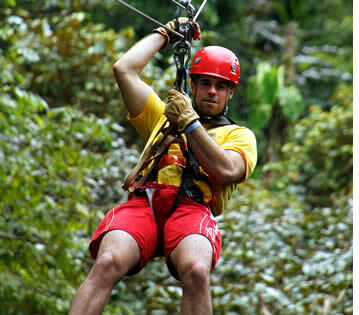 The Bastimentos Zipline Canopy Tour is a half day activity. The tour itself can last between 2 and 3 hours depending on group size and group dynamics. Anywhere from 2 to 15 people can be on the tour. Larger groups can also be accommodated as long as special arrangements are made (please contact us). We ask that all participants remain flexible regarding time. WE GO RAIN OR SHINE! Guests are expected to depart from Red Frog's Public Dock on Colón Island (Bocas del Toro's main island) at 10 a.m. or 2 p.m. This boat trip takes about 15 minutes and and costs $7 USD per person round trip (or $4 one way). Guests can also make their own way to be at Red Frog's Marina at 10:15 a.m. or 2:15 p.m. Please confirm your plans when making your reservation (specially if you need a boat ride so that we can reserve a space for you). Upon arrival at Red Frog Resort's Public Dock and Welcome Center, a shuttle will transport you to Kayukos Lodge where guides and friendly guest service staff will greet you and help you register for the tour. You will be asked to sign a release of liability and disclose any relevant medical conditions. Here we will make sure you have proper footwear and clothing, aren't wearing any dangling jewelry, and we'll also ensure that your hair is arranged in a way that keeps it from being an entanglement hazard. This is the time to ask any last minute questions, use the restroom, or address any concerns. The tour will leave promptly at the scheduled departure times. 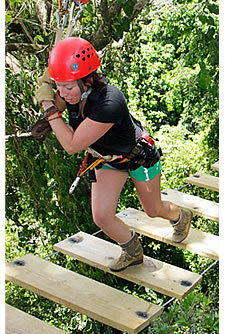 A 5 minute 4x4 ride will take us to the Rainforest Zipline Canopy Tour entrance. There, we will take a very short, scenic hike to the staging area and give an in-depth safety talk, gear everyone up, give skill instruction, and do a guide demonstration on a sample "mini practice zip line & platform". A suspended sky-staircase leads you to the first zip platform. You will be clipped into a safety line beginning at this staircase and will remain clipped during the entire tour. 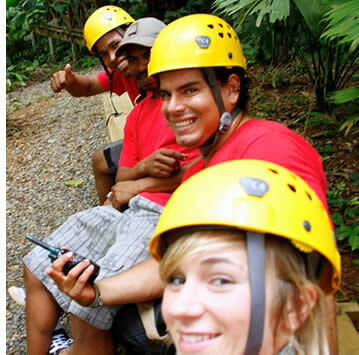 You will travel from platform to platform via one small hike, ziplines, an assisted high to low platform rappel and/or an optional ropes course and tarzan swing. At the end of the tour, you will take a small hike to the 4x4 transport that will take you back to Kayukos lodge where you can share stories, memories of the trip, look at photos/videos, depart for your next adventure, order lunch or dinner, hike to the beach, and/or just sip on a cold fruit smoothie or cerveza! What to Do Before or After the Tour? 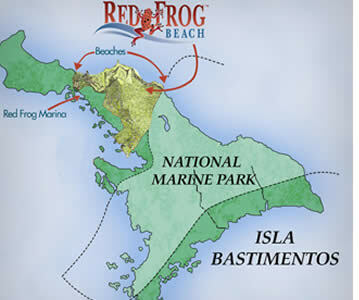 You can plan to spend time at Red Frog Beach before or after the tour depending on the start time of your tour. The first boat to Red Frog Marina from Isla Colon departs at 7 a.m. and the last one returns at 5:30 p.m. The hike from Red Frog Marina to Red Frog Beach is around 15 minutes but allow at least 20 minutes, with the Kayuco Lodge (where the tour departs from) being in the middle. Lunch and dinner is also available before or after the tour at Kayuco Lodge or at Punta Lava Beach Bar & Grill on Red Frog Beach. Surfboards can be rented at Kayucos Lodge. If you'd like to enjoy an uncrowded day at Red Frog Beach, we recommend signing up for the 2 p.m. tour. There tends to be less people at Red Frog Beach in the morning as many boat tours end their day at Red Frog Beach and tend to arrive after noon. 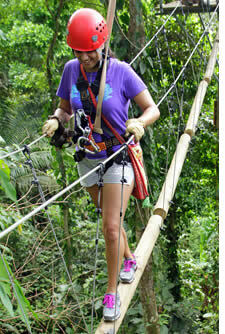 What to know before you zipline...Click to collapse. Who Can Come on Tour? How to Dress, What to Bring and What to Leave? Can I Go if I Have Medical Conditions? 1. Who Can Come on Tour? 4 years is our minimum age allowed. Anyone lighter than 70lbs (30kg) may be escorted by a guide during the tour and maximum weight allowed is 300lbs (135kg). Participants should be able to hike short distances (less than 0.25 miles or 400 meters) and should be in reasonable physical shape. An adult must accompany children under 16 years of age. We cannot allow pregnant women to zipline. We reserve the right to deny any individual access to the tour in order to uphold our safety standards. If you have any doubts, feel free to contact us before making your reservation. 2. How to Dress, What to Bring and What to Leave? Wear comfortable sports clothing appropriate for humid or wet conditions. 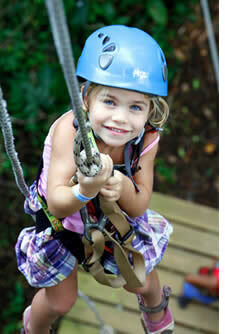 Avoid loose clothing that could tangle in ropes or other gear. Skirts should be avoided. The Zipline Canopy Tour runs rain or shine so come prepared with rain gear and shoes that have good traction and do well in muddy conditions. Sandals or flip-flops are highly discouraged. We offer shoe rental in the event you do not have appropriate shoes for the tour. You should remove any dangling jewelry and tie long hair back. Our advice is to remove all items from your pockets before going on the tour. You will have a chance to store any items that cannot be clipped to your harness during the tour before departing to the Jungle Canopy. Anything you bring on the tour itself must not be an entanglement hazard or have the potential to drop during the tour. We will provide a secure and locked storage area. We are however, not responsible for the theft, misplacement, or loss of any items. You can bring your camera on tour, however, it will be very difficult to use during the tour because you will be wearing gloves. The tour is also very "hands on" and you will only be permitted to use your camera while standing on the platforms. It is essential that your camera is secured to your body while zipping, rappelling or on any other element of the tour that requires your undivided attention. We sell mini carabiners for this purpose. If you choose to bring a camera please know it is at your own risk and there is a possibility that it will be damaged. A photographer is available and will accompany us on the trip. Photos are made available to view and to buy afterwards. An HD helmet-mounted camera is also available for rent. Rain actually brings out many Red Frogs and other animal life not normally seen. Weather conditions that cause us to cancel tours are excessive rain, wind, and/or lightning. In any case, you should show up for your tour. We may cancel a tour minutes before it begins or anytime during a tour due to the varying weather patterns here. In the event of cancellation before a tour, we will try to get you on another tour or will offer a full refund. We will offer a re-schedule or partial refund upon our discretion if the tour is cancelled anytime during the tour. 5. Can I Go if I Have Medical Conditions? It is initially your responsibility to determine whether or not you're capable or fit to participate. Bastimentos Sky reserves the right to exclude any guest from participation for medical, safety or other reasons. 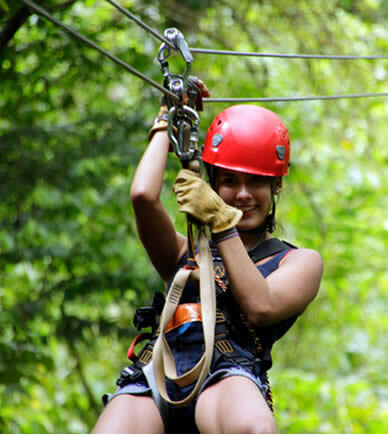 The canopy tour is designed for participants young and old of average mobility and strength who are in reasonably good health. Obesity, high blood pressure, cardiac and coronary artery disease, pulmonary problems, pregnancy, arthritis, tendonitis or other joint and musculoskeletal problems may impair the safety and well-being of participants on the course; as may other medical, physical, psychological and psychiatric problems. All such conditions may increase the inherent risks of the experience and cause the participant to be a danger to themselves or others. 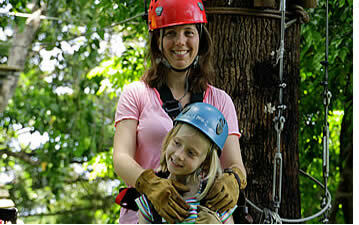 Participants with underlying medical problems that put themselves at greater risk of injury or illness during a canopy tour must carefully consider those risks before choosing to participate. They must fully inform tour staff in writing prior to the beginning of the tour. How safe is the tour? Overall, very safe. 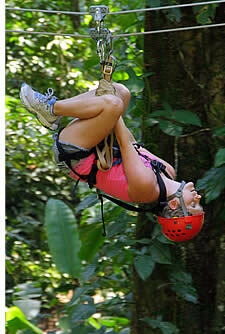 Please be aware that there are inherent risks taken on any canopy tour. We carefully manage those risks by extensive planning, training, and attention to detail in both the construction of the course and the ongoing development and management of our guides. Please know this experience is meant to be authentic and engaging, participants are asked to be aware of their surroundings, and maneuver themselves through the tour safely. Generally speaking, this canopy tour is safer than your last taxi ride. Bastimentos is nature lovers' paradise. Of its 52 sq. km (20 sq. miles), the mid-section of the island and some of its surrounding waters are part of the Bastimentos National Marine Park. The north shore of Bastimentos is exposed to the surf and offers visitors miles and miles of stunning sandy beaches such as Playa Primera or Wizard Beach, Playa Segunda, Red Frog Beach, Polo Beach and Long Beach or Playa Larga, which attracts various species of sea turtles in the nesting season and a handful of privileged surfers. 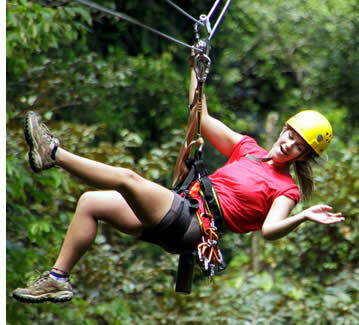 The zipline canopy tour itself offers amazing ocean views and if you're lucky enough you can also spot beautiful wildlife such as red poison-dart frogs, sloths, howler monkeys and many types of birds. Needless to say, plant life and trees are extremely abundant. If before or after the zipline canopy tour, you'd prefer to spend your time within the jungle instead of the beach, you can also hike several trails within Bastimentos' island. At Kayucos you will find several maps and the helpful staff will be able to point you in the right direction. 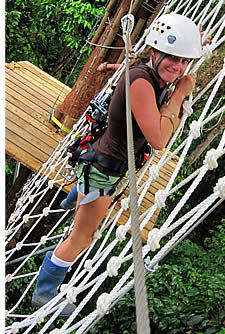 This one gives you more thrills than other ziplines in Costa Rica and Mexico do! Contact us!